I have been super afraid of trying an adult sized project of any kind in crochet. It seems far too daunting. But this!!! This I think I could totally handle! 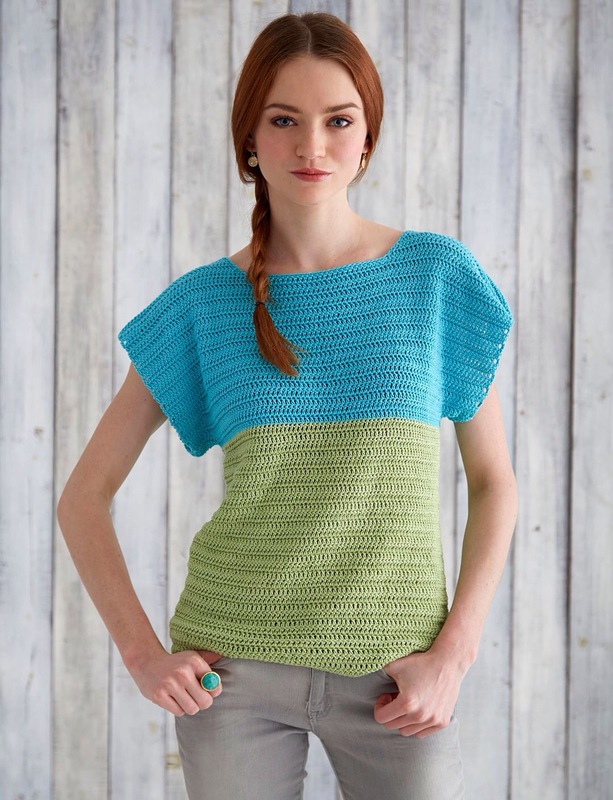 New free pattern from Yarnspirations, may I introduce the Colorblock Top! I love the simplicity, how it hangs, and it’s a beginner pattern which perfect for scaredy cats like me. Not saying you are a scaredy cat. You are lovely. Check out the pattern here. Happy Friday! This entry was posted in Uncategorized and tagged arts & crafts, beginner pattern, crafts, crochet, free pattern, handmade, hobbies, shirt, top, womens top. Bookmark the permalink. ← coming up rose hat: ta-da! I keep wanting to make this top but not wanting to buy yarn just yet lol. I am sure you will do it well and I will live vicariously through you! Check out Yarnspirations for other patterns. I’m sure they would have something similar in the knitting area. They are pretty dreaming awesome that way.